This fantastic new fiction reading series for children aged 5+ combines structured phonic progression with great artwork and fun stories. Phonics enables new readers to recognize the individual sounds of English and to blend them, building confidence to tackle unfamiliar words without relying on memory and guesswork.Developed under the guidance of an expert consultant, I Love Reading Phonics matches the phonics that children are being taught in school. 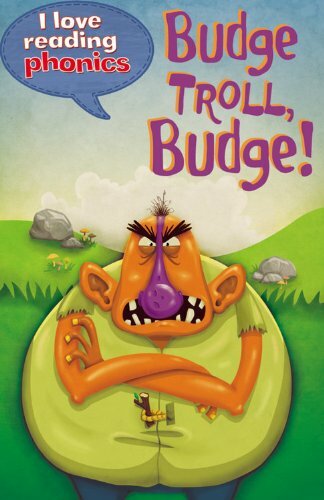 Budge Troll, Budge! is level 5 in this series. From a background in teaching, Abigail Steel has become a respected expert in the field of Synthetic Phonics and a regular contributor to educational publications. Her successful education consultancy supports parents and teachers in the promotion of literacy skills. She is a passionate advocate of Synthetic Phonics:"Synthetic Phonics is an incredibly powerful tool, enabling huge leaps in early years' literacy. Built upon these principles, I Love Reading Phonics helps children read and spell more confidently and more efficiently. The results are amazing!" - Abigail Steel.